Pulitzer Prize finalist, Luis Alberto Urrea, has written about the struggle people desperate enough to risk their lives crossing the Mexican/American border (Arizona) in search of a better life. The story itself is as old as the hills but this time, he paints a picture of the area so vividly, that if you've been anywhere in this region, you'll appreciate his descriptions even more. The people who abound, from many walks of life (and not only Mexicans), faced the oppressive heat and lack of water, not knowing where they'd land up, were brave and courageous. Urrea unfolds the account of the twenty-six men who ventured into the unknown and in search of a better life, and the "human hunt" that followed them. 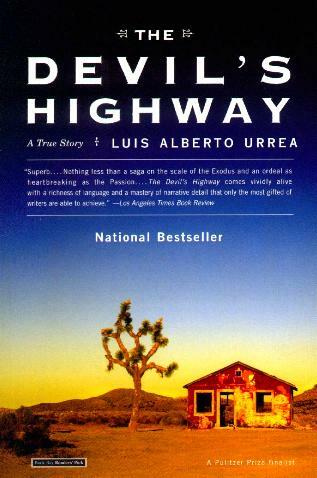 Their fears and dreams, the desert's own laws, and the stretch known as The Devil's Highway is all explained. Doggedly they pursue freedom but the price is extremely high, as the desert has obstacles few humans can survive. Urrea does a great job describing the officials whose job it is to patrol this particular area along the Arizona/Mexican border, as well as the brokers who help arrange these trips to freedom - usually at a high cost. There's a whole big and complicated maze of hindrances and human webs to deal with, often costing the ultimate price. I don't understand though, why people would risk dying by going when it's so unbearably hot and extremely dangerous. Conclusion - Harrowing, yet compelling.